234 p., 15,7 x 21,2 cm. The present volume contains the results of over thirty years of research in psychosis. 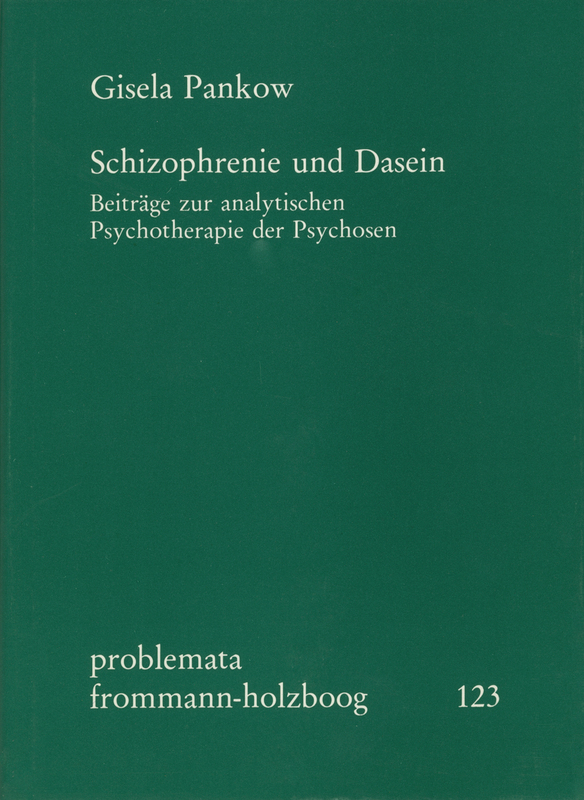 Gisela Pankow began this work in 1956 with the first French edition of ›Dynamic Structurization in Schizophrenia‹, a book which has been out of print and is now availabe in a revised German version for the first time since 1957 (chapters I and II). Chapter III describes new perspectives an research: ›Schizophrenia and Family Structure‹, ›Structurization Images and Phantasms in Psychosis‹, ›The Importance of the Concept of Form in the Approach of Psychosis‹. In chapter IV, Dr. Pankow elaborates on the concepts of rejection and identity and their relationship. Pursuing her literary analyses, she discovered the world of »fusion« and in chapter V interpretes two novellas by Elsa Morante and the novel ›Love in Times of the Cholera‹ by Garcís Marquez. In chapter VI the author gives a less systematic account of the state research on schizophrenia in the United States towards the middle of the 1950s. At a time when the work of American psychiatrists and psychoanalysts was nearly unknown in France, the author was in contact with the most important representatives of these disciplines, namely Rosen, Grotjahn, Frieda Fromm-Reichmann, Phyllis Grennacre, Bateson, Flanders Dunbar and others. This retrospective is followed by a long interview which clearly illustrates her Pankow’s position in 1978. After the descent into the »Abyss of psychosis«, two shorter stories about true and false schizophrenia conclude this volume.